Your recipient will have lots of fun with these spinning award medals. The front of these gold toned spinning sport and academic medals have a die cast action figure for educational, achievement or sport awards. Personalization on the back makes the medal reversible. 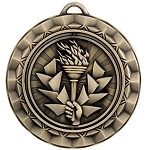 These medals are 2 5/16" wide and have a 1 1/2" engraved insert area on the back. Personalization and neck ribbon are included with each medal.